Kinema Club is a website devoted to the study of Japanese moving image media. We started as a small, informal group of scholars sharing xeroxed copies of tables of contents for film magazines, and since starting the KineJapan list have grown to over 800 members from all over the world. 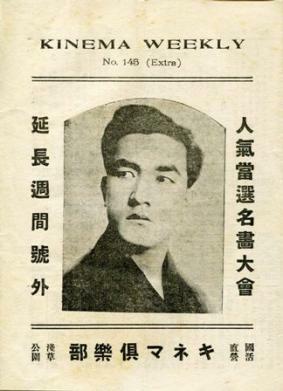 Our name comes from famous Taisho era movie theaters in Tokyo and Kobe (note the image of Sessue Hayakawa gracing the cover of the Tokyo Kinema Kurabu pamphlet). Kinema Club and KineJapan are inclusive and open by nature. If you would like to contribute information or entirely new materials to the website, you are welcome to join in. Contact the editors: Aaron Gerow at aaron.gerow@yale.edu or Abé Mark Nornes at amnornes@umich.edu.